UFC featherweight Chan Sung Jung has a fight with Ricardo Lamas coming up in July. The fight will likely have title implications, and will give "The Korean Zombie" a chance to prove he belongs at the top of the UFC's 145-lb. class. But the upcoming fight didn't keep Jung from speaking up to one of the UFC's biggest stars. Jung posted a letter on his Facebook page to UFC welterweight champion Georges St-Pierre about the Rising Sun symbol GSP wore to his fight with Nick Diaz. Hi, My name is Chan Sung Jung from South Korea. As one of many Koreans who like you as an incredible athlete, I feel like I should tell you that many Korean fans, including myself, were shocked to see you in your gi designed after the Japanese 'Rising Sun Flag'. 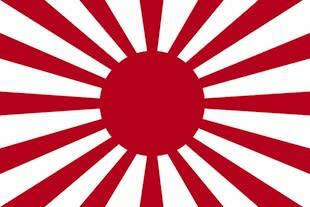 For Asians, this flag is a symbol of war crimes, much like the German Hakenkreuzflagge. Did you know that? I hope not. Just like Nazis, the Japanese also committed atrocities under the name of 'Militarism'. You can easily learn what they've done by googling (please do), although it's only the tiny tip of an enormous iceberg. I know most of them are not militarists. I know most of them do not approve unjustified invasion, torture, massacre, etc. They're just ignorant. It's such a shame that many westerners are not aware of this tragic fact. Wearing Rising Sun outfits is as bad as wearing clothes with the Nazi mark on it, if not worse. Since you're influenced by Japanese Martial Arts, your wearing a headband designed after Japanese flag is understandable. But again, that huge 'Rising Sun' on your Gi means something else. Many people say GSP is the best Welterweight fighter throughout history, to which I totally agree. This means you have a great influence on every single fan of yours all around the world. And I do believe your wearing 'the symbol of War Crime' is a very bad example for them, not to mention for yourself. So, what do you reckon? Do you want to wear the same Gi next time as well? The Rising Sun flag was used by the Imperial Japanese Army in World War II, and it was banned by the United Nations in 1945. Jung is not the only person to have an issue with seeing it used by an athlete. During the 2012 Olympics, Japanese gymnasts wore a leotard that was inspired by the Rising Sun, and some South Koreans were not happy about it. When one-time MMA sponsor Hoelzer Reich used Nazi imagery on the gear UFC and WEC fighters wore into the cage, the promotions banned their items from the cage. Jung has the courage to speak up to a fighter he admittedly admires. GSP and the UFC owe him a response. Since Georges St-Pierre wore our walkout gi at UFC 158 we have received attention surrounding the negative connotation of the rising sun graphic used. The last thing we want is to offend or alienate anyone with the choice of design on our products. We at Hayabusa have the utmost respect for culture and history and appreciate all of our customers worldwide. As such, we accept full responsibility for this design and are taking all complaints and comments very seriously. The gi worn by GSP will not be brought to market. In addition, we will be very conscious of this specific design element when developing future communication materials and products. Please accept our sincerest apology for any offence this has caused. If you have any questions or comments regarding this matter, please feel free to discuss it with us at customerservice@hayabusafightwear.com. One of our representatives will be happy to assist you. I'd like to also personally apologize to anyone who was offended by this. I am very sorry, that was never my intention. Both GSP and Hayabusa acted quickly to apologize. Though it would have been better if the symbol was never used, Jung used the moment to educate others on the issues with the symbol. For that, he should be commended.